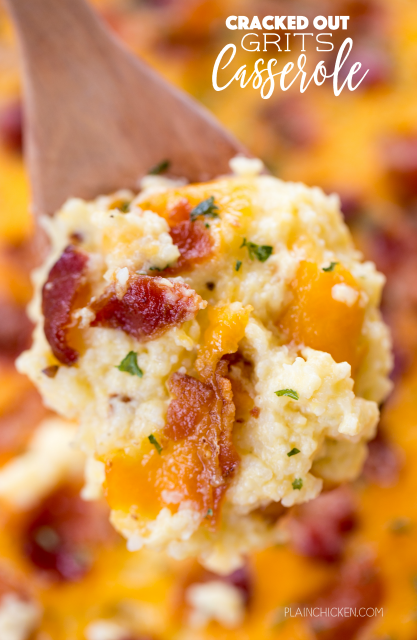 Cracked Out Grits Casserole - cheddar, bacon and ranch - SO addictive!!! We love this casserole for breakfast, lunch and dinner. Grits, chicken broth, milk, eggs, Velveeta, bacon, Ranch, cheddar cheese. Can make ahead and refrigerate or freeze for later. This always get RAVE reviews! SO good!!! Breakfast for dinner is a favorite in our house. We had this Cracked Out Grits Casserole last week and it was a HUGE hit! OMG! SO good! Grits loaded with cheese, bacon and Ranch. Seriously AMAZING! 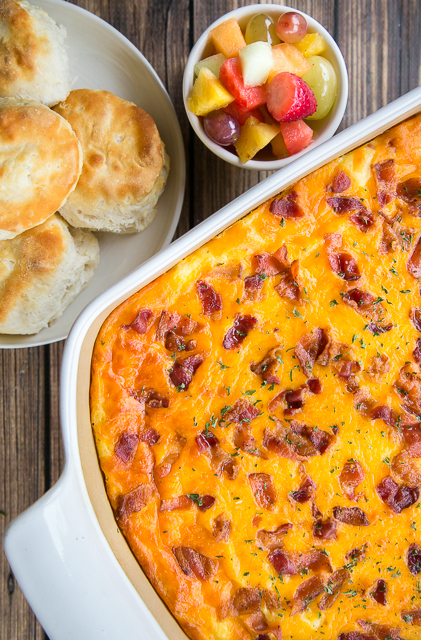 Now, I'm not a fan of plain grits, but I LOVE this cheesy bacon grits casserole. We served the casserole with some biscuits and fresh fruit. Easy and delicious! This Cracked Out Grits Casserole can be made ahead of time and refrigerated overnight or even frozen. I like to split the casserole into two 8x8-inch pans and freeze one for later. I love having quick meals in the freezer! This casserole is great for a potluck and overnight guests. It always gets rave reviews! Preheat oven to 350° F. Lightly spray a 9x13-inch pan with cooking spray. Set aside. In a large saucepan, cook bacon over medium heat until crisp, stirring occasionally. Remove pan from heat. Remove bacon with a slotted spoon; drain on paper towels and chop. In a large saucepan, add chicken stock, and Ranch dressing mix; bring to a boil. Slowly stir in grits. Reduce heat to medium-low; cook, covered, 5 to 7 minutes or until thickened, stirring occasionally. Remove from heat. Add Velveeta cheese and butter; stir until melted. Stir in milk. Slowly stir in eggs until blended. Stir in half of cooked bacon. Transfer grits to prepared dish. Sprinkle with shredded cheese and remaining bacon. Bake, uncovered, 40 to 45 minutes. is there some reason you only use quick cooking grits? can I just use regular and cook longer? That is a good question, can you help us out Steph? I love grits casseroles and this one sounds delicious. I'd be all over this! Great one, Steph! Do you use the same large pan using the bacon grease or is there a second pan without the grease? I didn't use the bacon grease in the recipe. I used a different pan. Could I make this the night before and put it in the oven in the morning? Can I put it all together the night before and bake it in the morning? I only have access to cornmeal, can I use this in this recipe? Cornmeal isn't a substitute for grits. It won't be the same. Well "Kiss My Grits" ...These are fantastic. I subbed andouille sausage for the bacon. Brought in for office pre-Thanksgiving party -- Huge Success!